Maximize your salonâ&#x20AC;&#x2122;s earning potential. Let Meevo 2 show you how. 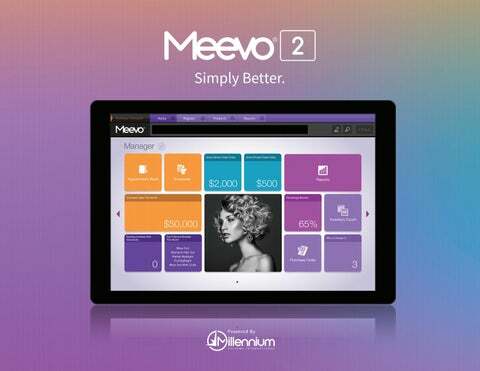 Revolutionary Cloud-Based Software Meevo is the most powerful, simple, and unique point-of-sale and management system in the industry. Millennium System Internationalâ&#x20AC;&#x2122;s Meevo is the next generation of beautiful tools for a beautiful industry. The Time Clock, Simplified The Time Clock in Meevo is designed with the user in mind. Punching in and out is quick and beautiful, all while maintaining accuracy. Your World in One Screen The Smart Center is a live tile representation of data. Everything you need to manage your business right at your fingertips. Tell Meevo What You Want Simplify front desk operations and give your staff more time to take care of clients. The Convobar® is a revolutionary way to look at the appointment book. Type or speak in dates, service providers, clients, and more to instantly find what you need. A Smart Appointment Book Made for Beauty Professionals Intuitive, sleek, and sophisticated - Meevoâ&#x20AC;&#x2122;s Appointment Book makes booking and managing appointments simple. The Register That Has It All Meevo’s point-of-sale system is robust and easy to use. With elegance and ease, finalize each and every sale without any hassle. Make Your Business Available 24/7 Meevo’s powerful booking platform allows you to create a customized interface that speaks to your brand. Included with your Meevo subscription, Online Booking provides clients with ownership in the process, giving them control, flexibility, and convenience – a necessity in today’s fast-paced digital world. Security & Alerts Meevoâ&#x20AC;&#x2122;s advanced security system makes sure that your data is locked down. Monitor your business whether in-house or on the go.